Prisons and immigrant detention centers are cages that harm and kill. Yet in 2013, the Internal Revenue Services (IRS) granted the two biggest private prison companies, Geo Group and CoreCivic, a special status that would designate them as “real estate.” On June 5th, community members from the Freedom Cities movement disrupted the annual REITWeek investor conference, calling for an end to the collusion between private prison companies, government, and banks. “These corporations and investors are plotting new ways to push our people out of their homes and into prisons, and are being rewarded to do so,” stated Cindy of Enlace, using a bullhorn outside of the Hilton Midtown hotel at 3:00pm, the same time CoreCivic presented to major investors, like JPMorgan Chase, Bank of America, and Wells Fargo, who sent their representatives to the conference. As is now more regularly shared in the news, private prison companies have made a business out of caging black and brown people. Through the Real Estate Investment Tax (REIT), prison companies CoreCivic and GEO Group pay no corporate taxes, and pass on 90% of their profits to investors. 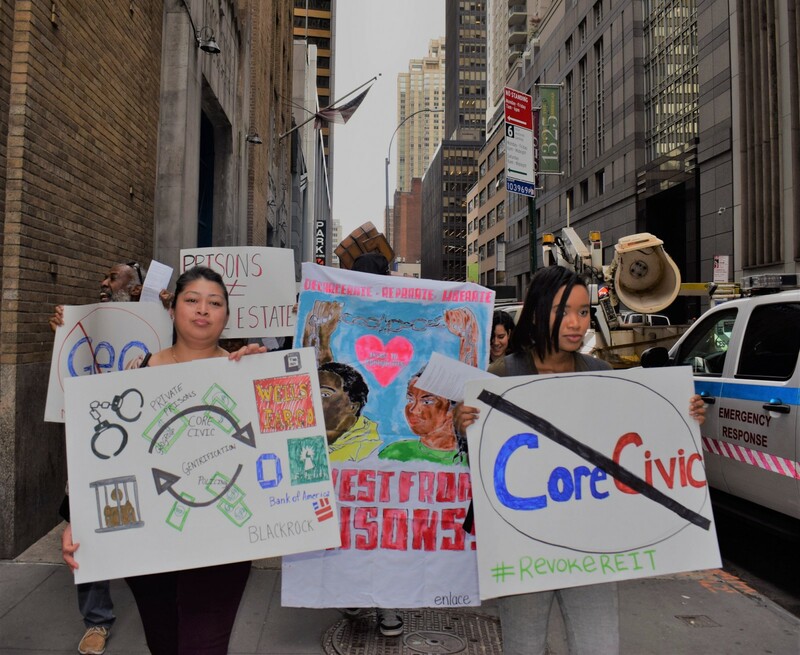 REIT status has enabled these companies to attract more capital to lobby for the increased criminalization and incarceration of our communities. “Once people start investing in something, they expect growth. That is how capitalism works. If they start investing in more prisons and more detention centers, trust me, they are not doing it without the intent to spur those prisons and detention centers to be filled. If they want these prisons to be filled, we are going to see more police in these communities, and more gentrification in our neighborhoods,” said Al of Black Alliance for Just Immigration. The REIT status makes clear that the gentrification-to-prison pipeline is financed by speculative industries whose bottom line is to make billions at the expense of black, brown, and poor people. When low income people are pushed out of their homes due to predatory real estate practices, they are funneled into the prisons built by the likes of CoreCivic and Geo Group. “We know roughly 35,000 people are currently being coerced into labor. It is hypocritical for these corporations who profit and benefit from exploitation of non-citizens to say they provide housing, when they are prisons. We ask for an end to these senseless and inhumane policies. Tax breaks should be helping our communities,” said Violeta of Families for Freedom. Rather than using our tax dollars to fund affordable housing, mental health and youth programs for our people, the government is subsidizing almost one hundred million dollars that will ultimately be divided amongst shareholders that represent the richest interests in the country. Previous efforts to call attention to Geo Corp and CoreCivic’s REIT status helped push Senator Senator Ron Wyden (D-OR) to introduce the Ending Tax Breaks for Private Prisons Act of 2016. In November 2017, Sen. Wyden re-introduced the bill. If passed, the legislation would end Real Estate Investment Trust (REIT) tax breaks for companies that derive their income from the operations and maintenance of prisons. 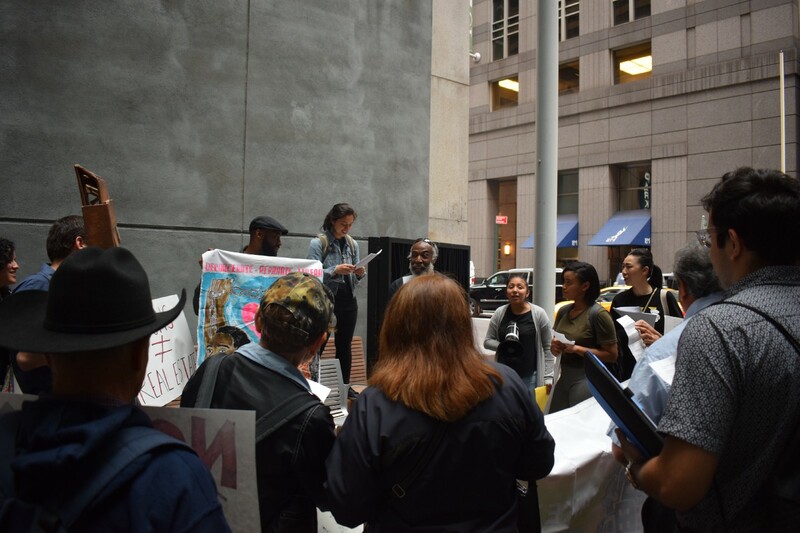 Sign the petition now to demand that The Joint Committee on Taxation revoke REIT one step in ending the gentrification-to-prison pipeline. Freedom Cities is a national coalition committed to divesting from prisons, the police and profit, and re-investing in people and the planet.